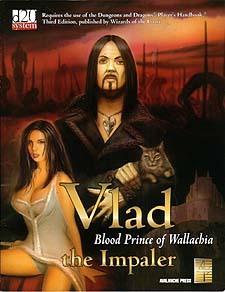 For over 500 years, people have spoken his name in whispers: Vlad the Impaler. Prince of Wallachia. Dracula. The books and movies paint him as a monster, a madman, a destroyer of souls. The reality is worse. This d20 system sourcebook tells the real story of Wallachia's blood prince, with the real Romanian folklore that inspired Bram Stoker. Add new monsters and prestige classes from the Wallachian setting plus an adventure featuring Vlad that is compatible with Last Days of Constantinople. And it all really happened.